In a tribute to the last few years in the life of the 16th President of the United States Abraham Lincoln, the United States Mint will release the 2009 Lincoln Cent Presidency in the winter of 2009. The Presidential $1 Coin Act of 2005 (Public Law 109-145) authorized this fourth installment of redesigned one cent coins to be introduced into circulation in 2009 to celebrate the bicentennial of Lincoln's birth. The first coin in the series, 2009 Lincoln Cent Birthplace, was released on February 12, 2009 and contained a log cabin on the reverse to signify the humble beginnings of Lincoln who was born in a log cabin in Kentucky. Demand for this coin was high, and within 2 weeks of release, the two roll set the United States Mint had been offering was sold out. For more detailed information on this, see Lincoln Coins Sold Out on CoinNews.net. Second in the series, 2009 Lincoln Cent Formative Years, portrays Lincoln reading a book while taking a break splitting rails in Indiana. The third installment, 2009 Lincoln Cent Professional Life, shows Lincoln standing in front of the state capitol building in Springfield, Illinois. It was here in Illinois that Lincoln became a self-taught lawyer and where he first had political aspirations. The fourth and final installment in this series shows a half-completed United States Capitol dome. In front of this scene of construction, Abraham Lincoln gave his First Inaugural Address in 1861, shortly before the Civil War broke out. A mere four years later, the body of Lincoln would lay in state underneath the dome. He was assassinated a few days following the end of the war. This reverse was designed by Susan Gamble and sculpted by Joseph Menna. Keeping the same design for 100 years, the obverse has the Victor D. Brenner portrait of Lincoln. Unlike the portraits on all other US coins, Lincoln faces right. The Lincoln Silver Dollar Proof or Lincoln Silver Dollar Uncirculated coins were also struck in 2009 as part of the celebration of the bicentennial of Lincoln's birth. 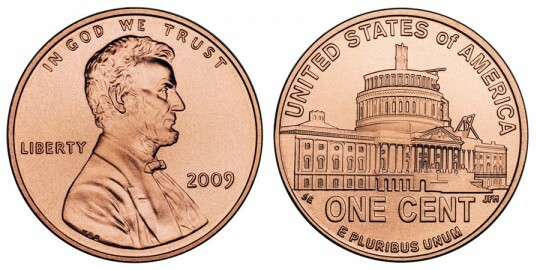 To find out information on the coin designed to follow the 2009 Lincoln Cents, see the 2010 Lincoln Cent. As it has appeared for the last 100 years, the obverse shows the Victor D. Brenner portrait of Abraham Lincoln facing right. This design appeared in 1909 on the first Lincoln Cent. The obverse also includes the words "IN GOD WE TRUST", "LIBERTY", "2009", and the mintmark "D", if minted in Denver. The reverse of this coin features the United States Capitol dome still under construction. It was in front of this that Lincoln gave his First Inaugural Address as the 16th President of the United States. Four years later, he would lie in state underneath the dome, having been assassinated. Also evident are the inscriptions "UNITED STATES OF AMERICA", "E PLURIBUS UNUM" and "ONE CENT". Designed by Susan Gamble and sculpted by Joseph Menna, this design is meant to symbolize a country torn apart.